When she was two years old, Maria Olmstead enjoyed watching her father paint. So, he gave her some paper, brushes, and paint, and she began to play with them. By the time she was three, others thought her play was beginning to look like art, and a local coffee house displayed her paintings. By the time she was four, a local gallery exhibited her work, art critics were hailing her as budding master (mistress? ), and The New York Times ran a feature story about her. 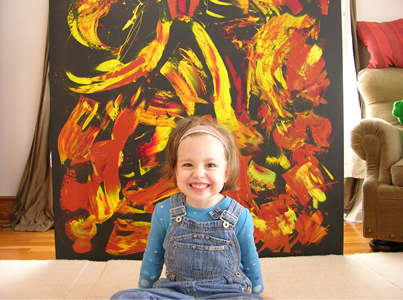 At four years old, she had become an international sensation and rekindled an old debate about modern, abstract art: Is It Art? We can’t conceive of a four year old creating a brilliant play, poem, sculpture, piece of music or a painting that depicted something in a realistic way. So, the criticism was grounded in the fact that only abstract art could recognize a painting by a child and deem it masterful. And by what criteria? What’s the difference between squiggles, arbitrary brush strokes, and splattered paint- and seriousart? You may have thought this debate was long resolved, but Maria re-invigorated hostility to modern art. Her work and her age became a lightning rod for renewing a debate, but that was just the tip of the iceberg. Five months after The New York Times piece, Charlie Rose featured Maria on a segment of Sixty Minutes II. It concluded that someone, probably her father, had worked on the paintings, and they could not be considered as the true creation of a four year old. An unobtrusive camera captured her doing one painting. And this one work that everyone agreed could be attributed solely to her was, according to art experts, a markedly inferior creation. For her more acclaimed works, we had only the word of her parents that she had done them entirely herself. Suddenly a controversy about artistic standards had morphed into a story of parents who might be defrauding art buyers and exploiting their child in the interests of their egos and/or bank balances. But how could we know the truth? Enter Amir Bar-Lev, a young documentary filmmaker (Fighter) who had approached Maria’s parents at the outset of this saga. He wanted to document the early years of Maria’s life for a film, and, in return, offered the family a video record of what appeared to be the beginnings of a remarkable career. Bar-Lev was soon a member of the family and given unfettered access to everything. So, we see the candid camera recording the giddy months of international celebrityhood, the shock and depression following the Sixty Minutes II piece, and then the family fighting back with a new video showing Maria creating a painting in its entirety. What makes Bar-Lev’s film especially fascinating was a moral dilmma that emerged for him. Initially, he believed Maria had created all of her paintings, but then he began to have doubts. These doubts put him at odds with his new family, and made him feel, perhaps rightly, that after having gained their trust he was now going to hang them out to dry. This cursory account of the story only hints at layers of fascinating complexity. For example, if the father did tamper with Maria’s paintings, did the mother know? It’s entirely possible that she was being conned by her husband, along with the public. And one wonders about the impact of all of this on Maria herself. Moreover, even if her father did modify her paintings, when we see her in the act of creating a painting, she certainly seems to be doing something far more artistically complex than anything I’ve ever seen by a four year old. And so it goes. Some will criticise Bar-Lev for being too close to this subjects. I found that his intimacy with the family deepened the story, and he does a good job of raising the broader question of a filmmaker’s obligations to those who have trusted their story to him/her. The problem with his subjectivity is that he never goes beyond the circle of the family and their friends to help us understand the story. Virtually everyone we get to know is partisan to the family’s side We do see glimpses of the Sixty Minutes II program. But Bar-Lev never pursues independent experts to comment on the quality of the art work or the phenomenon of parents who exploit their precocious children. But these are quibbles with a fine film on an endlessly complicated story.